* The coastline, the hydrographic and a geophysical base of precision resulting from the geographical service of army are the strong points of this map of Paros and Antiparos Islands. Between the livel lines (by 100 m.), the nuances of the scale of chestnut underline the volumes of the mountain. * All beaches with their name, roads and the paths which lead there. Moreover, one small text presents the best beaches of the island. * Complete inventory of the road network, even secondary dirt tracks or without exit, particular labeling of the picturesque courses with a green color, and mileage of precision from crossroad to crossroad. * Archaeological sites, monasteries, vaults, castles, headlights, caves, and of many other sites to be visited, marked with high degree of accuracy. * Short texts (in Greek and English) which present the history, the current face, local products and the most important things to know about the island. * at the recto of the map exists a complete list of the residences of the island, useful telephones, information on the local routes, etc, a synoptic guided tour of the island, and many photographs of characteristic landscapes complete the presentation. 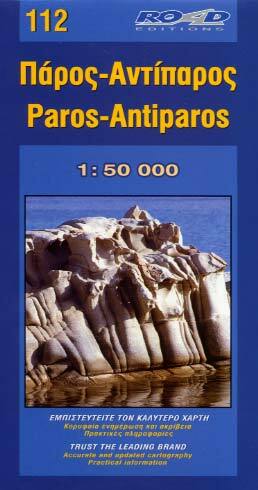 * The map includes Antiparos, Stroggylo and Despotiko.